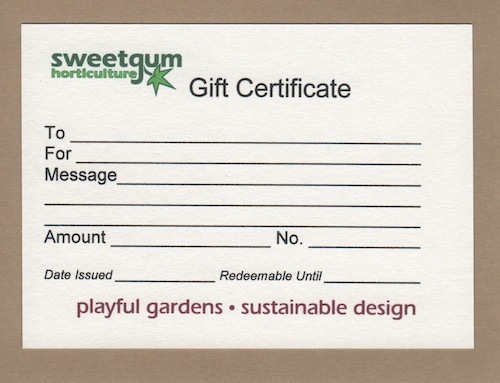 Catherine Volic, the owner of Sweetgum Horticulture, offers a unique range of garden design, coaching and horticultural services. Her goal is to help people enjoy the outdoor part of their homes to the fullest. She has a special interest in creating playful spaces where children can interact with the natural world, but she is equally qualified to provide garden design and comprehensive property planning, as well as instruction in fine gardening skills and creating organic vegetable gardens. 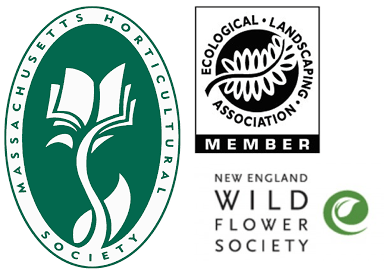 An important part of her philosophy is the use of native plants wherever possible, along with sustainable design practices that protect the water, air and soil. Learn how to start a garden from the ground up. Plant an heirloom tree for your children to grow up with. Join the local food movement. Snip fresh herbs for dinner. Plant a nibble garden for tiny chefs. Watch the garden waking up in the spring. Breathe in the fragrances of flowers and foliage. 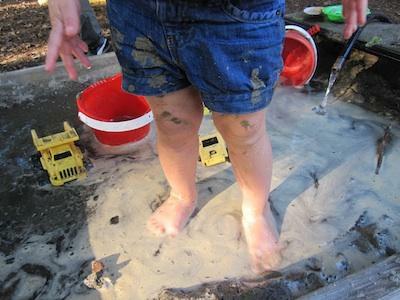 Make your yard a place that engages you and your family through all five senses. Get outside and play. Take little risks. Blow bubbles. Stomp in puddles. Wiggle your toes in the sand. Collect sticks and stones. Chase fireflies on a summer night. Have fun. 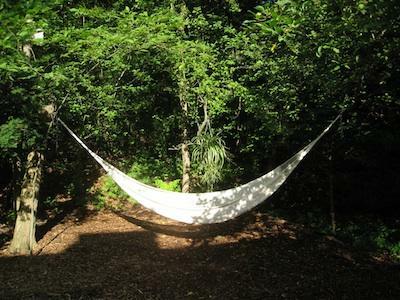 Snuggle together in a hammock. Watch the world from a hidden spot. 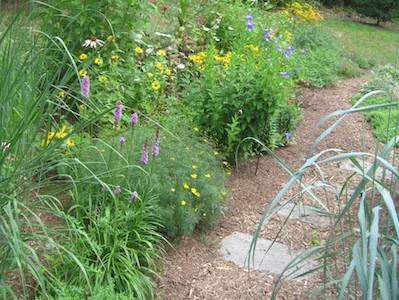 Plant gardens of native plants that nourish songbirds and butterflies. Replenish the hidden life of the soil. Reconnect with your children and to nature. Use your little bit of earth to help heal the planet. Everything looks great - I'm very pleased with it all! I can't thank you enough for the beautiful garden you designed. It is truly an honor to have it named after me. I love everything about it! You clearly put a lot of thought into the beautiful (and fun) plants you chose. I look forward to seeing children interact with it and enjoy it. We just love how it is all turning out! It's such an enormous change, and we honestly couldn't be happier! Thank you so much for all of your hard work.. I got your information packet—it is exactly what I needed and I love having your write-up to refer to! Very nice presentation, by the way. You are obviously a professional! I felt like I got so much out of our walk and am thrilled to have found a gem like you. Catherine is smart, thoughtful, detail-oriented and thorough. But her greatest gift is her eye for creating beauty that appears unplanned and effortless. Catherine is a wonderful gardener. She has creative ideas, incorporates native plants, and is very knowledgeable about ways to keep gardens healthy and pest-free. She is very thoughtful about her gardening and pays close attention to detail. She's a joy to work with! Catherine is exceptionally professional and thorough. She developed a wonderful plan for our property that took into account the style of our home as well as our outdoor needs. We highly recommend her expertise as a way to take your landscaping to the next level. Catherine's knowledge of native and invasive plants is impressive, and she has an innate talent for garden design that works with the natural forms of the land. She had great suggestions for how to re-imagine our large and overgrown yard to make it safe and inviting for our toddler daughter, as well as beautiful and rewarding for us. Catherine has taken a wild overgrown area and transformed it into a special place that children and adults alike gravitate toward: an open area for play, a secret forest path, a digging spot, a climbing tree, herbs to eat and flowers to wonder over. Catherine has been working on my garden for more than four years, from existing only on paper to now full of beautifully chosen and placed plants. She has found and worked with subcontractors and managed my projects as well as handled maintenance and annual planting. She is a pleasure to work with: organized, reliable, thoughtful, and open to my ideas while highly creative with her own. My yard garners praise from everyone who visits. I feel lucky to have found her! Catherine took a dry, lifeless area in our front yard and reimagined it as a lush, interesting, and sustainable garden we'll enjoy for years to come. The entire process was a pleasure. We're very grateful! You and your helper did a great job. You are both very efficient and reliable, so thanks a lot for taking care of my place! Catherine took what was a challenging lot and made it into something simply beautiful. She also went out of her way to create a plan that works for us and our lifestyle. She was great working with people like us who had no idea what would best for our lot. She is the utmost professional and was highly organized and efficient throughout the entire process. We continue to get frequent compliments and we never could have accomplished this without her expertise! We absolutely love our new outdoor spaces that Catherine designed and created. We recently down-sized from our home in Weston and were lucky to find a condominium in Wellesley, but the outdoor spaces were not very inviting. Catherine’s vision and design for these areas have transformed the space. She has always been professional and responsive to our needs, and her maintenance work keeps the spaces looking their best. !